The key to feeling satisfied — and never deprived — WITHOUT overeating. How often do you keep on eating because you think you're still hungry, only to feel uncomfortably full, even sick, after you're through? It's not because you have a lack of willpower or an out-of-control appetite. There's a very simple thing you can add to your diet that might help solve that problem forever. Once you do it, your brain can STOP signaling you to eat excess food. You'll learn to eat just the right amount naturally, and feel pleasantly satisfied, never deprived. How to turn a “bad” food into a “good” food! You can make whatever you eat significantly healthier and more nourishing. It's easy, once you understand the secret to doing it. YES! I want to lose weight and get healthy. My name is Marc David. I’m a nutritional psychologist and counselor with more than 20 years' experience. And I’m here to offer you a different, better, and more nutritionally sound way to get the body and heath you want. I've put together a comprehensive program for metabolic transformation, based on more than 20 years of research and practice in the fields of nutrition and psychology. Expressions like these reflect the idea that the digestive system has a brain all its own. One that is intimately connected to the rest of the nervous system, yet also an independent locus of command. Scientists have proposed that this “brain in the belly”— known in the scientific world as your Enteric Nervous System, or ENS — contains over 100,000,000 neurons. That’s more than the number of nerve cells in the spinal cord. Digestion is NOT a strictly physiological, mechanical process. It is powerfully, profoundly connected to and influenced by neurological processes—that is to say, by your MIND. Consequently, things that affect your mind — from your physical environment to your current emotional state to your self-image, memories, past experiences, and belief paradigms — can have a direct and often very surprising impact on how your body processes food. That's the missing link that is keeping too many people from enjoying health and physical fitness, in spite of all their efforts — while others seem to “break all the rules” of good health and nutrition, yet still manage to look and feel great. The ONE SIMPLE CHANGE you can make that can change your body for the better. It has to do with the food you eat, but I can tell you it's not what you think! If you do nothing else but this, you will improve the way you look and feel. It's so powerful ... and it's SO easy. The emotion that can change the metabolic process. Emotion contributes an important part of many people's nutritional life. Understand your emotional makeup, and you'll give your metabolic engine an incredible, permanent rev. I'll show you how. How to eat what you want for two weeks, and feel better than you do now. That's the promise I'm making you when you follow the simple plan I share in Session 6. It’s the two-week Pleasure Diet you have to experience to believe. Skeptical? Just try it and see! "You are what you eat"... right? Nope. "Eat right and exercise if you want to lose weight"... true? Uh-uh. I'll relieve you of some of the most misunderstood, misinterpreted, and flat-out WRONG ideas about health, weight loss, and well-being. To replace them, I'll share 12 unexpected nutritional strategies! You won't be deprived. You won't feel resentful. Yet incredibly, almost magically, you'll become healthier, more energetic, and - yes - thinner and more fit than you are now. Amazing! Do THIS one thing... and once you start doing it, you'll get into shape faster than you ever have before. Why? Because it has been shown to have a healing effect on the most important - and most abused - organ in your system: the one that determines whether your metabolism is fast and efficient, or slow and sluggish. It's available in any health food store or online ... and will have an absolutely transformational impact on your physiology. The eight-glasses-a-day dogma could be doing you more harm than good. You might need more ... but you also might need far less! This Session will tell you how to help determine what your body's hydration needs are so that you can maximize the remarkable power of nature's perfect beverage. There's no more powerful detoxifier in the world than your body's own 'climate-control' system. This Session reveals the NO-impact (and totally enjoyable!) secret to rejuvenating your blood cells and supercharging your metabolism. These secrets can change your body and your health! If that is what you want too, then I want to invite you to order my program to help you achieve that ideal state, through a process that is simple, natural, logical, and completely in tune with your body's innate instinct toward health and equilibrium. This FREE Session includes a dynamic Q&A session, in which Marc answers some of the most common questions about weight loss, exercise, food choices, and healthy living - with answers that are anything BUT common. You don't want to miss it! It really is possible to transform your biology, your body, and your nutritional destiny. A new metabolic you is waiting to be born. Get started by ordering Mind/Body Nutrition at a special limited-time discount today. P.S. If you've followed the fad diets without lasting success ... if you feel frustrated and confused by the conflicting nutritional information that you're bombarded with each day ... this program is going to give you the clarity, insight, and practical tools you've waited for and deserve. I want to transform my biology, my body, and my nutritional destiny! 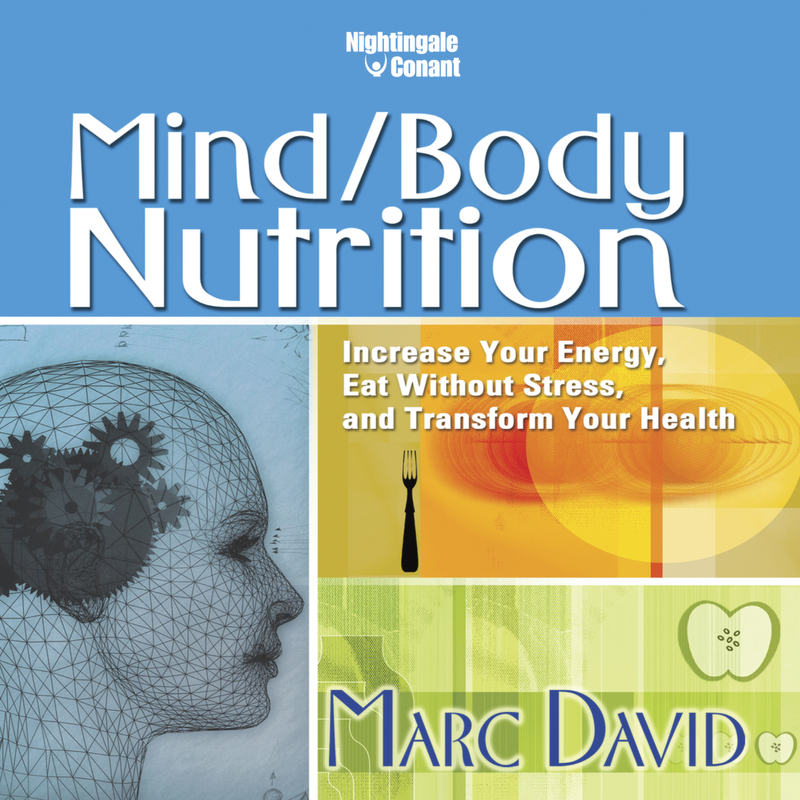 Please send me Marc David's audio program Mind/Body Nutrition, at the special price below. - I can select one of two ways of ordering.